This post is sponsored by Royal Canin. 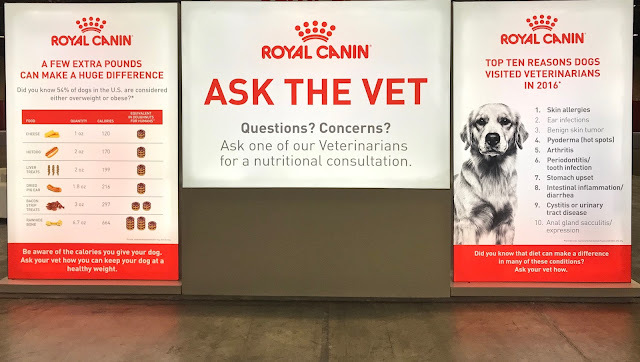 I am being compensated for helping spread the word about Royal Canin's sponsorship of the AKC National Championship, but To Dog With Love only shares information we feel is relevant to our readers. Royal Canin is not responsible for the content of this article. Last weekend we traveled to Orlando for the AKC National Championship Dog Show presented by Royal Canin™ and we had a terrific time! If you've never been, this event is one to put on your not-to-miss list... for about 8,600 reasons. That's because as the largest dog show in North America, the AKC National Championship boasts 8,600 entries from around the world. And that means you'll have no shortage of dogs to drool over and puppies to pet! Here are our top five reasons to attend! 1. Dogs, dogs, dogs and more dogs! The Orange County Convention Center venue is HUGE, so picture the biggest space you can imagine (this one is more than 1 million square feet!) and no matter where you look there are dogs, dogs, dogs! 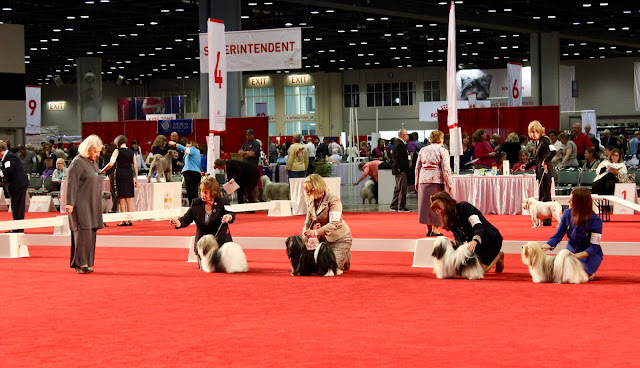 There are dogs competing in conformation with all 190 AKC recognized breeds entered and this year a new event was created for puppy show dogs. 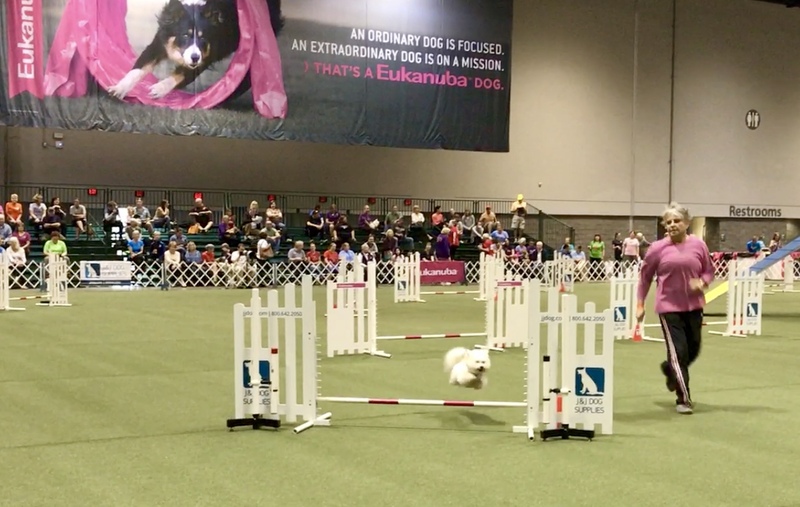 The inaugural National All-Breed Puppy and Junior Stakes is a competition for purebred dogs aged 6-18 months, showcasing the future stars of the show ring! 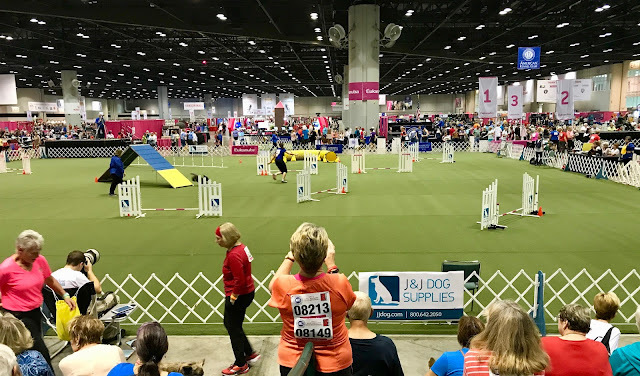 Additionally, we loved seeing all the performance dogs competing in agility, obedience, rally and dock diving, and all the dogs at Meet the Breeds... more about that below! It's a paradise for any dog lover! Looking out over an agility ring at the expansive venue, and this is just one small part of it! This is one dog show where you get to see nearly every dog event all under one roof. I put in LOTS of miles running from event to event because I didn't want to miss a thing. In addition to the conformation events, I camped out at the AKC Agility Invitational rings (of course!) and spent some time watching obedience, rally and dock diving dogs. So many amazing talented dogs! One of our favorites, Meet the Breeds is a terrific way to learn about so many different dog breeds. With more than 160 breeds represented we could have used another week -- at least -- to meet them all! This is a great way to talk to breed representatives and learn what dog is best suited for your family. And it's your chance to pet all the cute pups! 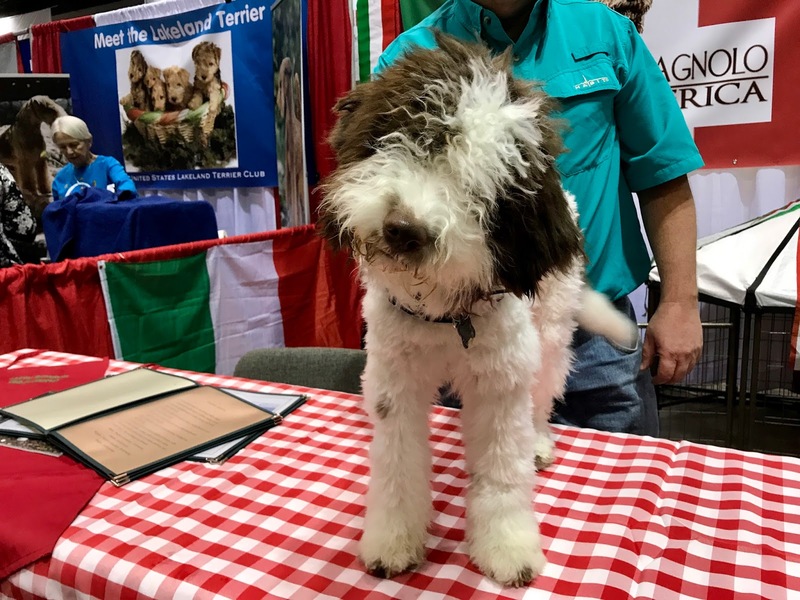 This is Lucy, an adorable Lagotto Romagnolo puppy. The breed originates from Italy and since the 19th century has been bred to hunt truffles! With over 100 vendors, this is a dog lovers shopping paradise! You'll find everything from jewelry to dog beds to toys and treats, and even a special dog walking jacket. 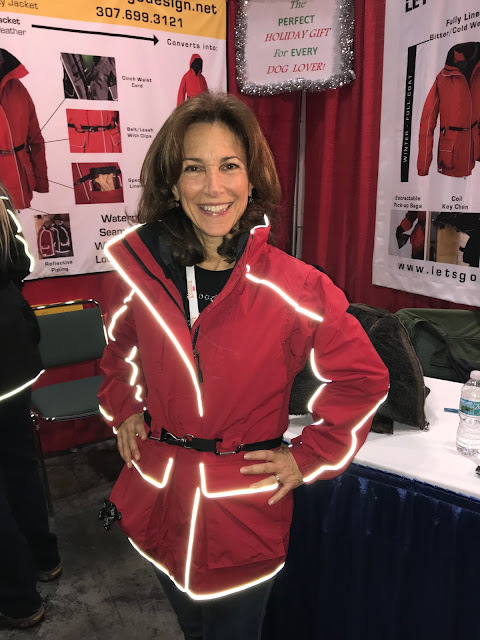 Check out this jacket from Let's Go Design, complete with poop bag dispenser, treat pocket and reflective piping! The camera flash makes the reflective areas glow. And the belt even doubles as a leash! Whether you're looking for a new activity to participate in with your dog or want to learn how to keep your pup a healthy weight, you'll find it at the AKC National Championship. Did you know that more than half the dogs in the U.S are considered either overweight or obese? With the help of smart nutrition and a fun activity, you can help keep both you and your pup happy and healthy! In addition to learning more about Royal Canin at the Royal Canin booth, we loved the demo ring, which offered information and demonstrations on scent work, trick dogs, disc freestyle, fly ball and more! So many great activities to try with your pups. We're working on a few of them now with Rocco! Miss the event this year? Not to worry. You'll find oodles of poodles fun videos and photos at live.royalcanin.com and then mark your calendar for the telecast on Animal Planet on New Year's Day at 7 pm ET with a re-air immediately following. 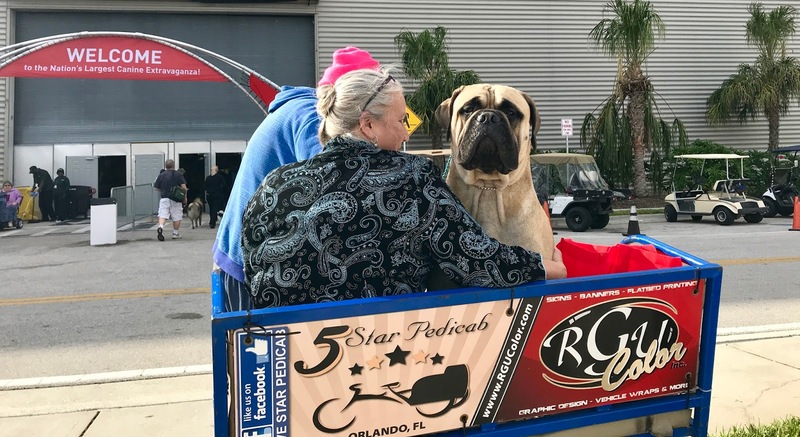 Jenny and her Bull Mastiff catch a ride after showing. See you next year! A great dog show and day surrounded by dogs always leaves me smiling. 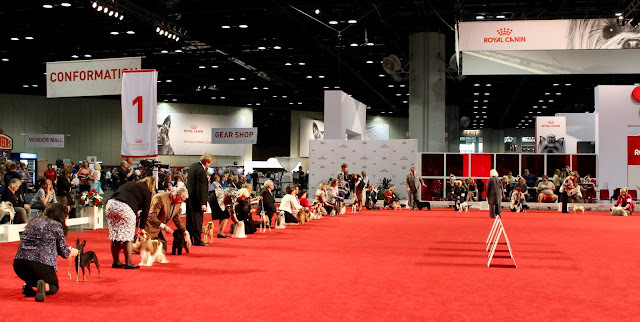 Have you ever attended this show or any dog show? Let us know in the comments below! a wonderful dog show, but unfortunately I missed it. when will the next be? This event will be televised on Animal Planet on Jan. 1, 2018 at 7 pm ET! Same time next year for the event in Orlando... typically second weekend in December. We'll be more interested in just over a week when the GBGV becomes a full AKC breed on 1/1/18 :) Love that jacket! Hurray! I saw some GBGVs and thought about you! The jacket is awesome, perfect for your weather. The folks who make it are based in Montana. Wow ,Championship Dog Show and Merry Christmas. Your dog is smart and smart. The dog is a clever animal. Really loved the images! Seems you have a professional photographer! i am dolly sing i write indian food recipes blog! I really loved your passion to search more live more. Aw~ I watched a fun video about a little dog messed up his test but still finish it in a cute way so I'm interested in these things even more. A portion of the more deceitful banks out there would like to trap clients in an interminable cycle of acquiring by submitting them to reimbursement designs that are relatively difficult to stick to. Keeping in mind the end goal to keep this from happening, you should read all the fine print and painstakingly survey the installment plans the loan specialist offers. In some countries, the profession of escorts is still illegal and also considered as unethical profession. In many countries, this profession is not acceptable by society. And India is also one such country where this profession . A useful wording is a great way to highlight the significant aspects of the topic keep it up. Independent Amritsar models escorts service available now. To find budget models, call girls in Amritsar. Search and meet with 100% satisfactions. I am the wonderful companion for any type of date, whether it’s a candle light dinner at any private restaurant, http://needlover.in/ an twilight at a pub with a lot of drink and dance, or an whole weekend of excessive pleasure. awwww. so cute i love the dog. The best female escorts in Mumbai are here. Thank you for sharing the creative and a wonderful blog post. Hello! I really appreciate your content. Its quite informative for various purposes. Howevere, I would like to suggest about an Australian Assignment help company, that is famous among students by the name Online Assignment Expert. So, the company that is Australia-based, consist of a team of more than 4000 highly skilled expert writers, who all are PhD holders from different reputed universities. Happily, I would like to tell tthat I am one of those writers and i am myslef associated with the team for last & years. Online Assignment Expert is offering their highly professional online assignment help services, to students that feel challenges in understanding concepts of subject study or fail to secure desired grades in precious b academics. The team has been working round the clock, to provide best acadmic assiustance at most reasonable price. Any student who feel the need for conceptual understanding can choose for one-on-one session services for better understanding. Also, we are offering free samples of almost all subjects for students on our website. Our team do extensive research on even the easiest of assignment help and prepare 100%authentic, plagiarism free work. To assure assignment quality, we use Quality Check Resource Enterprise System that examines assignments with 100%accuracy. Thus, for urgent assistance kindly visit our website or write to us at contact@onlineassignmentexpert.com.